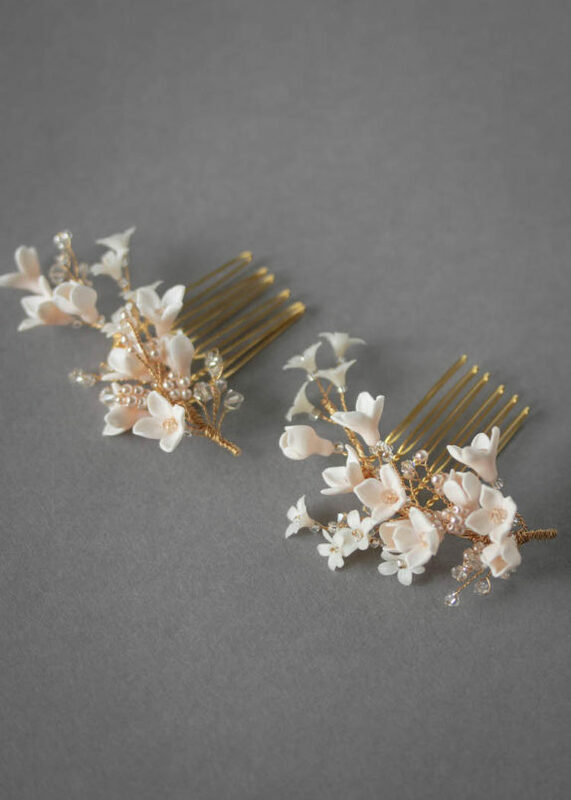 A set of bridal hair combs inspired by the fragrance and beauty of the ornamental lilac flower. This woodland bloom captivates and delights, and exemplifies our obsession with the garden. 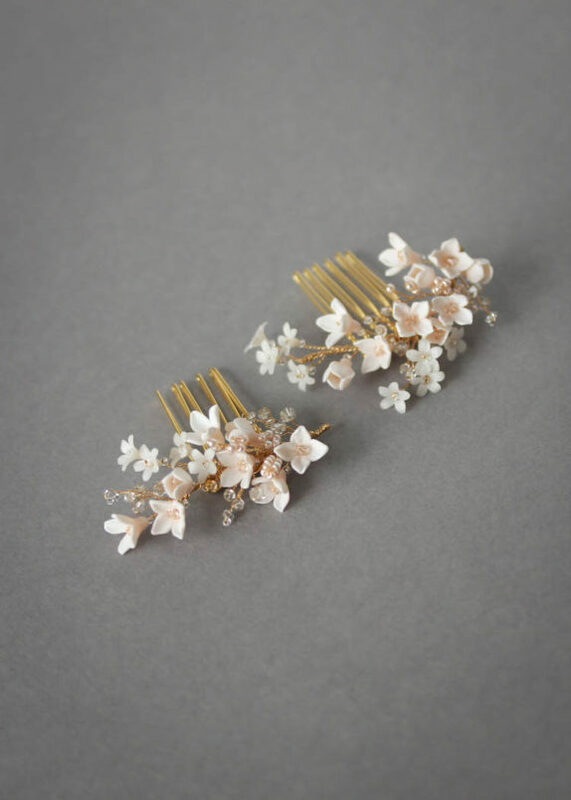 Designed to frame romantic updos, position these two combs to the side to create a captivating and feminine look. Featuring handcrafted clay flowers, Swarovski crystals and pearls, glass pearls, Czech seed beads. Attached to metal hair combs. Colours: Gold/blush or gold/ivory tones. The Lilac hair combs are made to order. Please allow 2-3 weeks for production plus delivery times. The Lilac hair combs are unconventional in their detailing yet classic in their aesthetic. Lilac is the perfect set for bohemian brides, garden weddings or seaside nuptials. The set can be styled along half up hairstyles or nestled along the curve of a romantic wedding updo. Style them closely in a row or space them out for a look that’s artistically ethereal. The Lilac set can be worn with a sleek minimalist veil such as our Audrey chapel veil. If you wish to style the pins to the side of an updo, Lilac can be easily worn with a traditional wedding veil. We recommend avoiding too many gathers in the veil as the heavy feel of the veil could overpower these delicate hair pins. Browse our full veil collection or contact us and we’d be happy to offer a recommendation to suit the Lilac based on your wedding dress and hairstyle. Details can be reworked into a new design – for example, a hair pin set, a larger headpiece or a crown with a low or high profile.